A powerful "Freshwater Fury" will leave the Great Lakes tonight, but not before unleashing more wind-driven rain, strong winds and pounding waves today. The corridor from central Ontario to Lake Michigan to Indiana will continue to endure the nastiest conditions today. A chilly, wind-driven rain in this corridor is making today downright miserable for anyone who has to walk around outside. The storm has pushed this year's rainfall to record levels in parts of Ohio. Umbrellas will be used more like a shield than an overhead covering to protect residents against the pelting rain, which will come down sideways at times. The rain is being whipped by winds that will gust between 40 and 50 mph at times today. The strongest gusts will be measured closest to the shorelines of Michigan and northwestern Indiana. At the immediate coast, gusts to 60 mph are not out of the question. The strength of the winds could damage numerous trees and cause power outages. Falling trees or limbs threaten to cause additional damage or bodily harm. Headaches also await travelers today. The winds will tug at vehicles, especially semi-trucks and campers. Airline passengers, including those at Chicago's busy O'Hare International Airport, should prepare for flight delays. Gusty winds expanding away from the Midwest could alone be responsible for flight delays in the South and Northeast, reported AccuWeather.com. Adding to the wild nature of today's powerful storm are the massive waves being generated across the Great Lakes. Waves between 10 and 15 feet will continue to pound the north- to northeast-facing shores of lakes Superior and Huron. Waves as high as 25 feet are slamming the beaches along southern Lake Michigan. These waves threaten to damage and flood the shoreline, also damaging docked boats in the process. 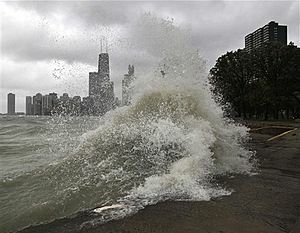 CBS Chicago reports that several people ventured to Chicago's Lakefront on Wednesday to view the massive waves. However, those thinking about doing the same today should heed a warning. Standing or jogging right along the Michigan and Huron lakeshores will be dangerous. The same can be said for the north-facing shore of Lake Superior. Conditions will improve across the Great Lakes tonight into Friday as the "Freshwater Fury" weakens and tracks northward into eastern Canada. As the adverse weather leaves, residents should keep in mind that the Great Lakes bearing the brunt of today's powerful storm is just a sign of things to come this winter.